On Thursday, May 20, The Film Foundation and Vanity Fair hosted "Reel Talk" at the Directors Guild of America in New York City. The third event in an ongoing series celebrated the Academy Award-nominated filmmakers Robert Altman and Buck Henry. Moderated by Stuart Klawans, the three engaged in a lively dialogue on the relationship between film and politics. A reel of clips from Altman’s most notable films and those that have inspired him — including NASHVILLE, TANNER 88, SECRET HONOR, BATTLE OF ALGIERS, and CITY OF GOD — was also shown. Following the discussion, more than 350 guests enjoyed Gallo of Sonoma wines and specialty cocktails compliments of Hpnotiq at a private party on the 42nd floor of Le Parker Meridien, overlooking the spectacular Manhattan skyline. Greater Miami Convention and Visitor’s Bureau was also a sponsor of the event. 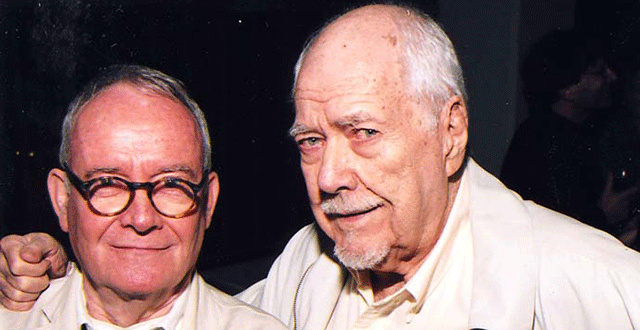 Picture: Buck Henry and Robert Altman at the Reel Talk NY event.